Seattle storage startup Qumulo is ditching the last vestige of the “stealth” tag today, revealing what it has been building and selling to enterprise customers. The company was started by Isilon veterans in 2012 and now has about 90 employees and $67 million in funding. 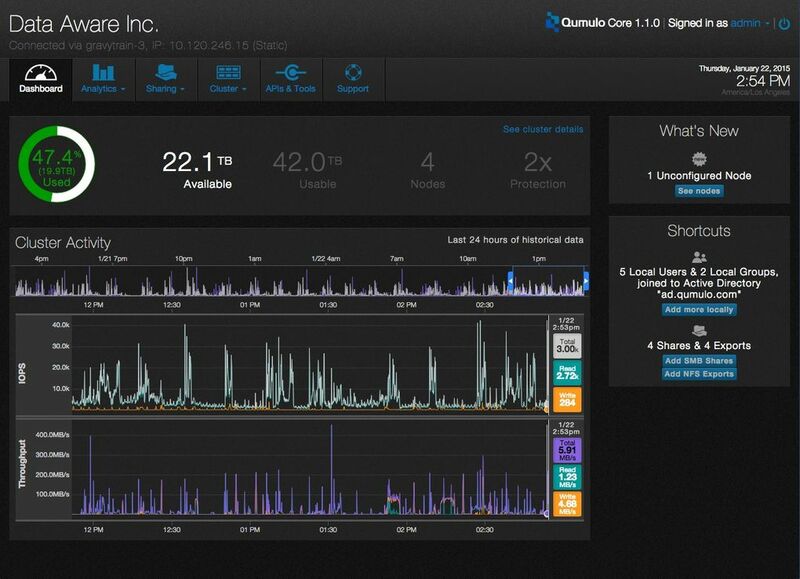 Today it’s sharing details of Qumulo Core, the “data aware” storage system that it began selling last August. The system has built-in analytics, so users have more visibility into how data is being used and tools to better manage massive file collections. Qumulo designed the system around a new file system — Qumulo Scalable File System, or QSFS — which takes advantage of the faster speeds of flash memory that’s increasingly replacing spinning hard disks in network storage setups. Chief Executive Peter Godman said the system is designed for a new era of storage. The 1990s were marked by storage in small buckets, requiring companies to keep track of where things were and to rebalance data. The 2000s saw storage systems like Isilon and Amazon.com’s S3, which could scale indefinitely. Now the challenge is managing data within these storage systems, especially for companies storing petabytes of data. “When people are dealing with petabytes of storage and billions of files and they’re using scaleable storage, they tend to run into problems not with storage itself but the data,” he said. Since August, Qumulo has sold the system to about 15 customers, including three of the top five animation studios and one of the major energy companies. One buyer is the Institute for Health Metrics and Evaluation at the University of Washington. Another is Sportvision, a Chicago company that powers the yellow lines superimposed on football broadcasts indicating first down markers. It was giving Qumulo feedback as it developed the storage system, then decided partway through to buy the system and put it into production, Godman said. “What has us really excited about Qumulo is that now we can quickly determine what to save and what can be archived. That gives us a level of data lifecycle management we just didn’t have before,” Grant Turner, Sportvision IT manager, said in a release. Qumulo’s entry-level storage appliance — with a four-node, 100-terabyte storage cluster — starts at $50,000.